Note before we start, all of these are state or county parks and nearly all are manned continuously by park employees. 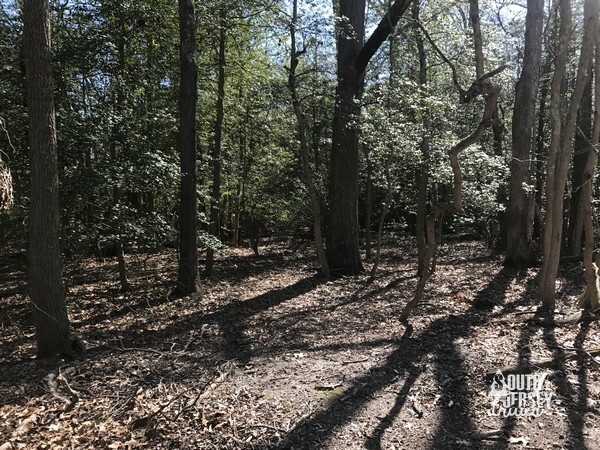 You won’t need dirt roads to get to any of these, or need to venture deep into the woods where your car will get stuck. So don’t let those worries get in the way of exploring! 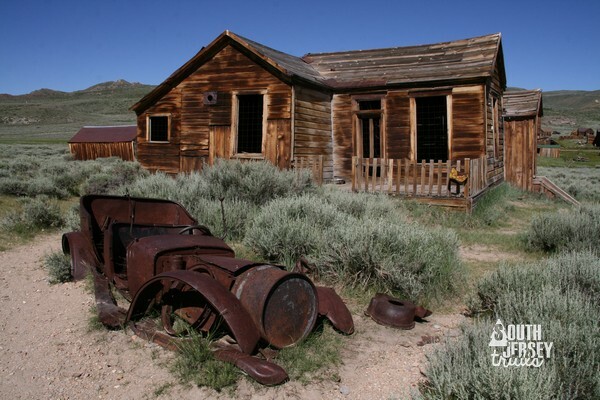 Without further ado, here are SIX ghost towns you can go explore! Weymouth is the site of an old iron works. 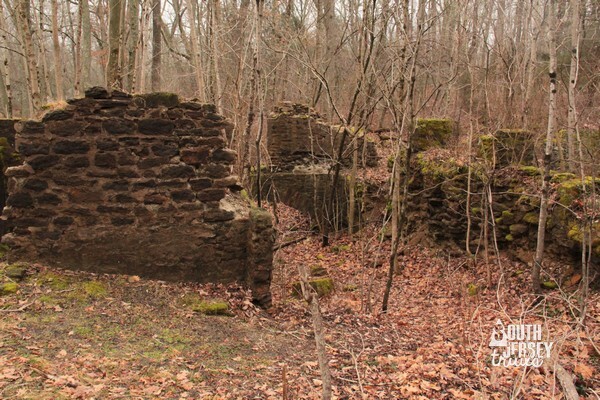 A furnace and a forge were both in operation here by 1802, and were taken over by Samuel Richards (remember that name, it’ll be back a lot this post) early in the 19th century. 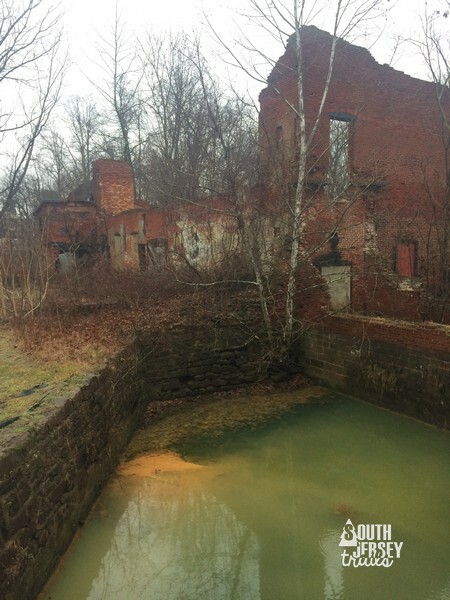 After the furnace and forge closed down, a pair of paper mills was established here. 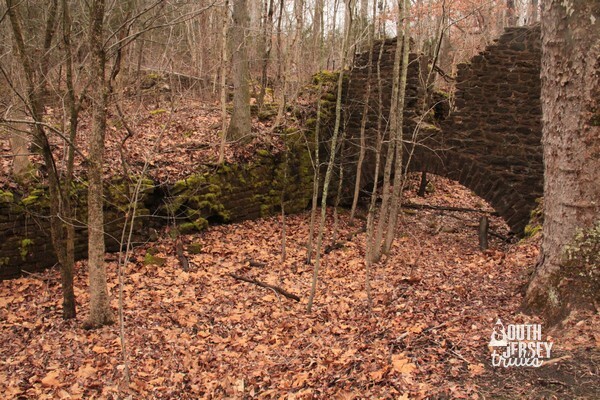 The remains visible today are the remains of those two paper mills. 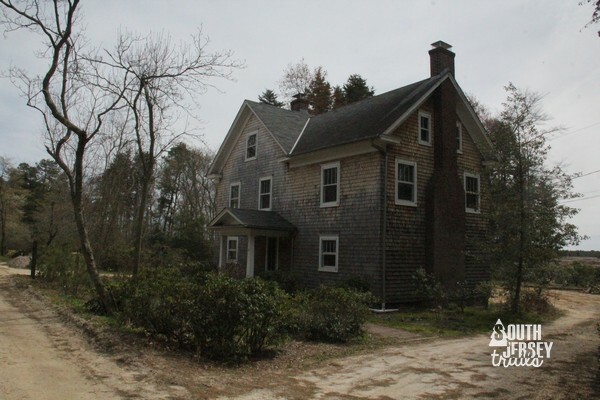 With the stack sitting by the Great Egg Harbor River, this is perhaps the most picturesque of the pine barrens ghost towns on this list. 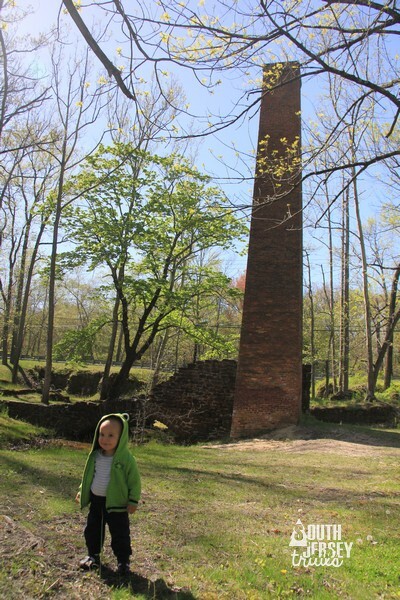 You can also explore the John’s Woods Preserve across the way, which has some more of the remains of Weymouth. 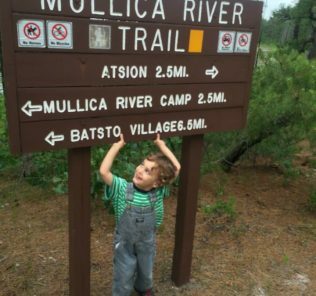 Sure, there are eighteen miles of hiking trails here, but forget looking for nature and start looking for a munitions factory. 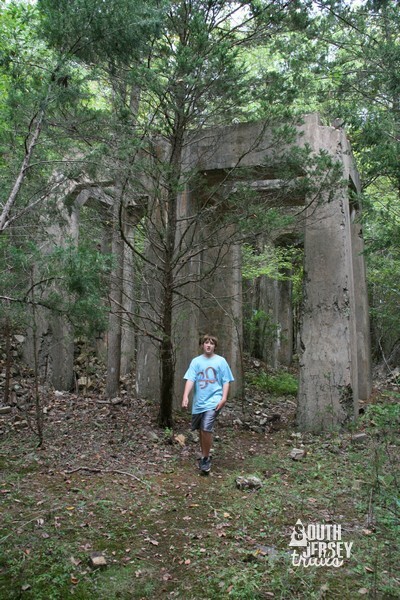 That’s right, this whole park was part of a massive ammunition factory complex during The Great War (aka World War I). 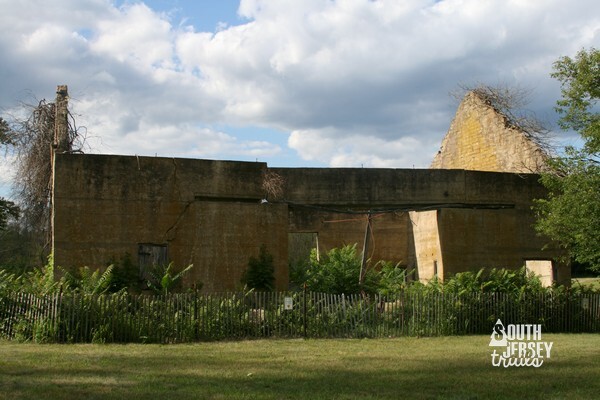 You can’t wander more than a hundred feet in this park without running into the remains of one of these old buildings, many of which are still pretty intact for being 100 years old. As a bonus, the Estell Glass Works remains are also in the park. 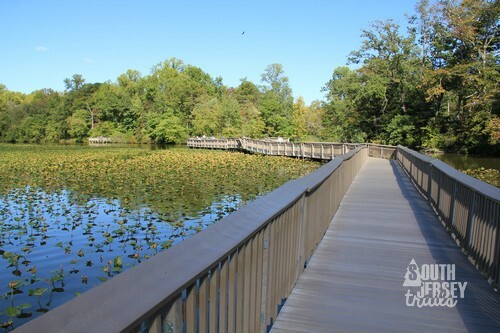 Drive right up to the parking area on the park loop and take a walk around. The glassworks come complete with explanatory signs to help you understand the glass blowing process! 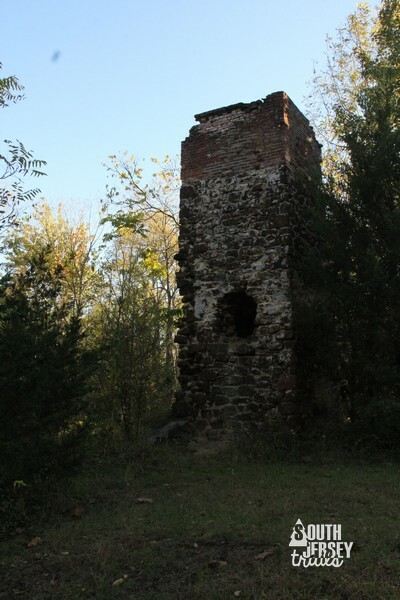 Another old furnace town, this one was started by Charles Read before the War for Independence. 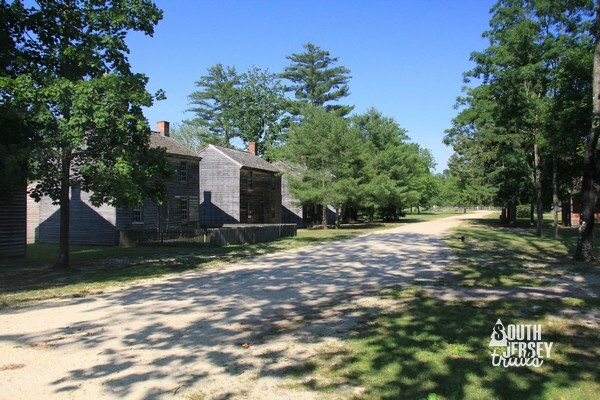 Like most iron towns in the pines, it was later acquired by the Richards family. 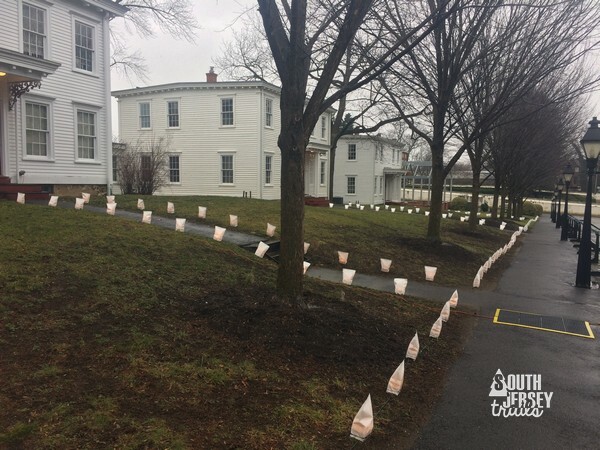 The centerpiece of the village is the 1824 Richards mansion, which has an imposing location on the dirt Quaker Bridge Road, which would have been the highway through the area at the time and not Route 206. 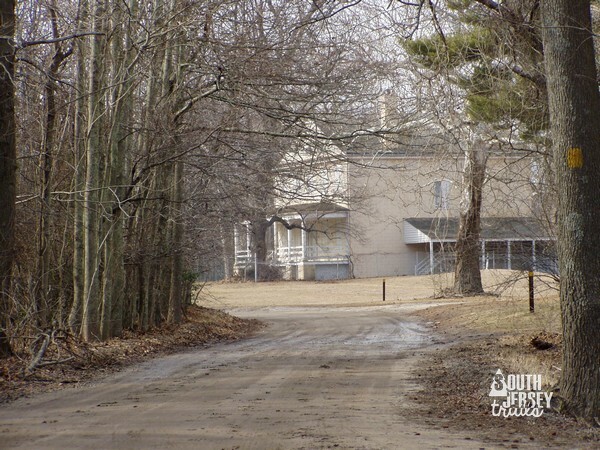 After the iron era, there was a shortlived farming community here called Fruitland, followed up by a cotton mill here, and finally the purchase of the property by financier Joseph Wharton, who used it for various enterprises. 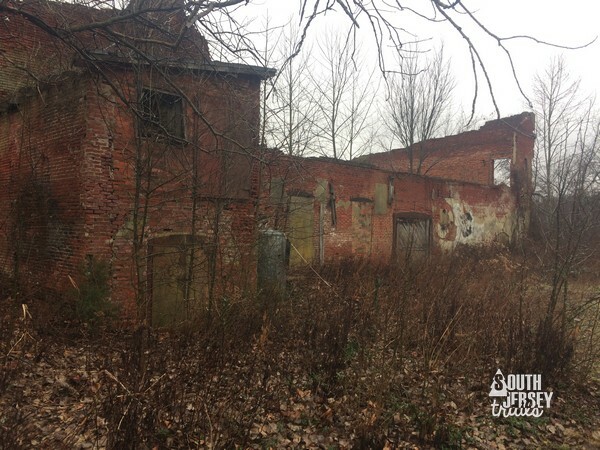 Even during my lifetime, the village has been disappearing, but you can still see the concrete Wharton era barn, the old church, the schoolhouse, and the remains of the cotton mill here. 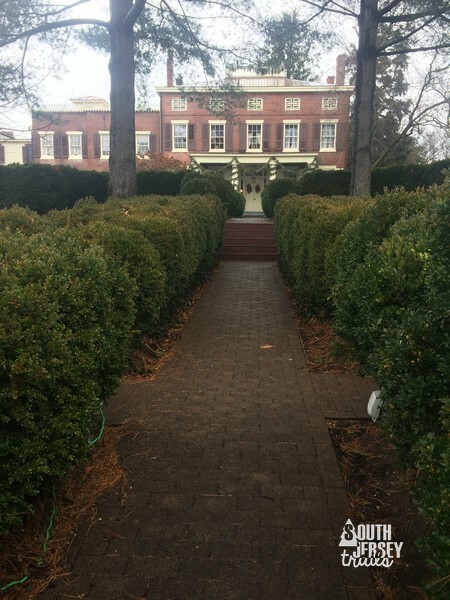 One of the improvements that has come to Atsion of that period is that the old Richards Mansion is open for tours now, which is a great way to spend an hour if you can make one of the correct times during the season. Q: What does a bicycle factory, a moose-drawn carriage, and a bicycle railroad have in common? 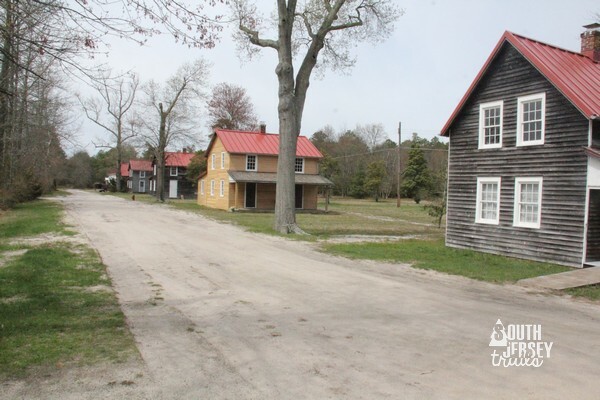 A: Hezekiah Smith and his model village in Burlington County. 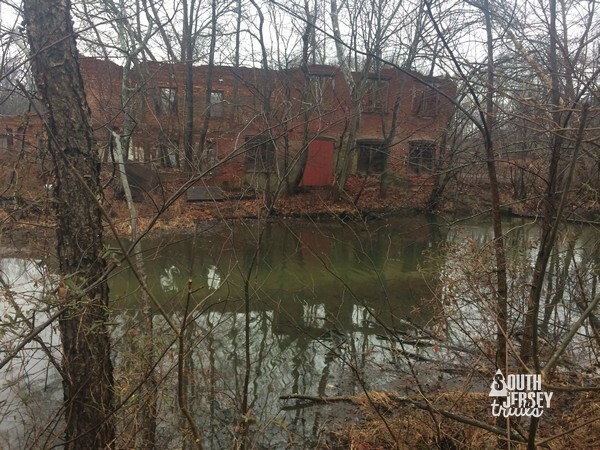 Before Mr. Smith, there were mills here and well as a cotton cloth manufacturing center named Shrevesville. 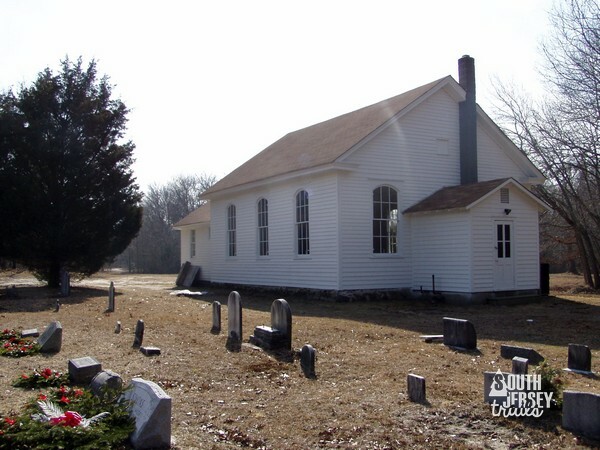 But it was when Hezekiah Smith brought his company here at the end of the Civil War, a company who was here late into the 20th Century, the whole area was renamed in his honor. While his machine works were very successful at this location, the most famous product made here was the Star Bicycle, a successful early model of that contraption. A Star Bicycle going down the steps at the capital building. Because public domain. 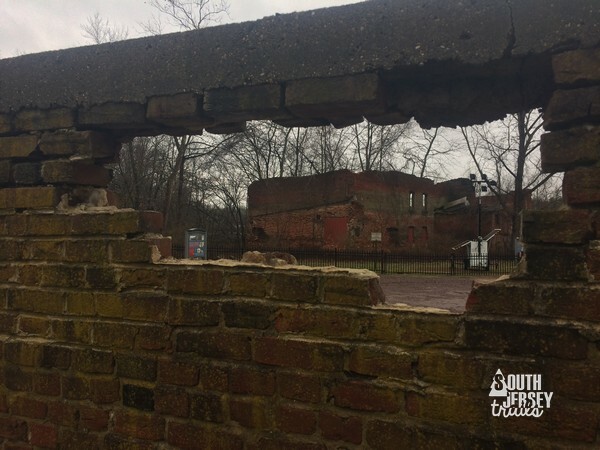 Now a county park, you can wander past the remains of the various factory buildings here, check out the Worker’s House Museum, and take a tour of the Smith Mansion. 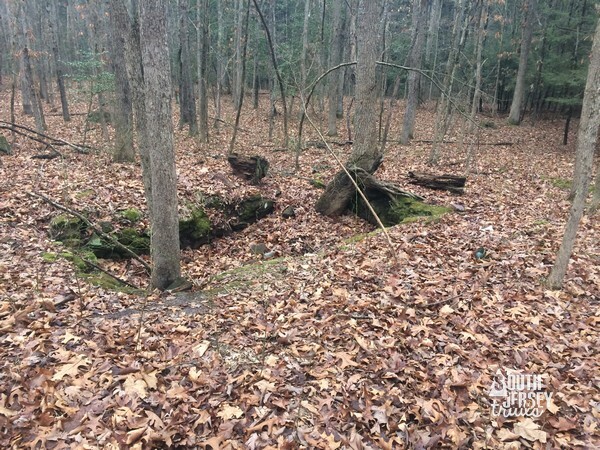 This was the site of one the earliest cranberry operations in the area, going back to almost the Civil War. 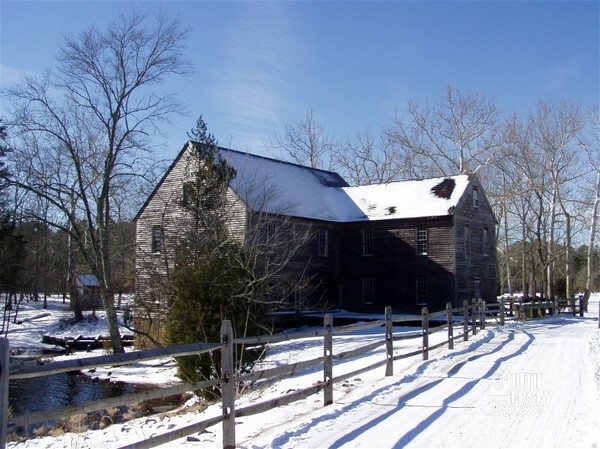 However, it’s true claim to fame came when Elizabeth White developed the commercially viable blueberry here. 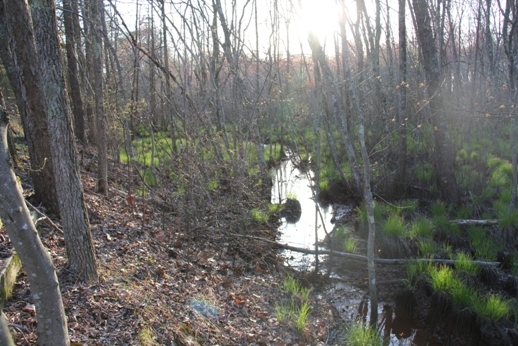 Now part of Brendan Bryne State Forest and run by the Whitesbog Preservation Trust. 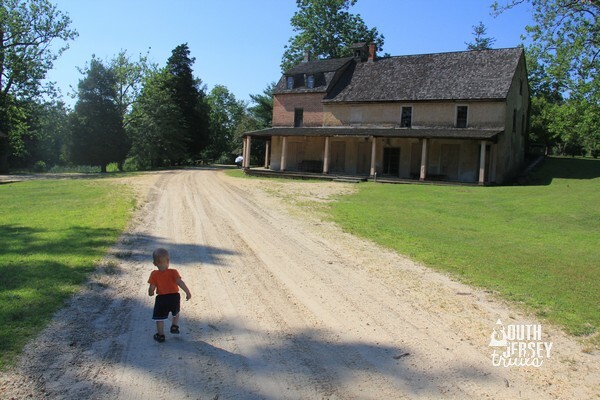 This village is different from our other ghost towns, in that several of the buildings are leased as private residences, even if the old workers homes, schoolhouse, and collapsed cranberry packing house are vacant of residents, children, or cranberries. 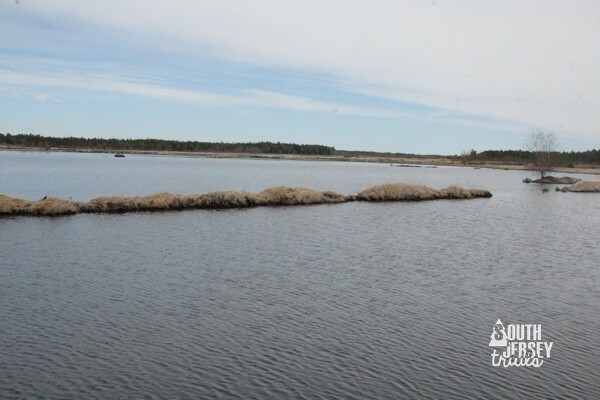 When you are tired of looking at old buildings, make sure to take the self-guided driving tour of the bogs. A great time to visit in during the Annual Blueberry Festival held each June. 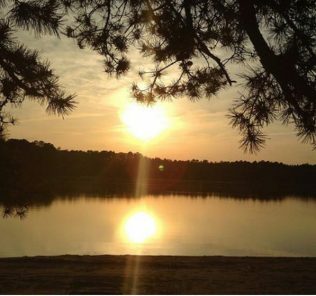 As author Barbara Solem states right in the title of her book on Batsto, this is the “Jewel of the Pines”. 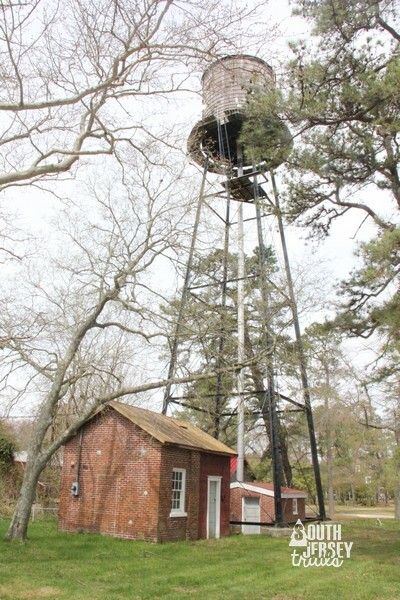 A New Jersey Colonial Williamsburg, this old iron/glassmaking town goes back to the pre-Revolutionary War days. 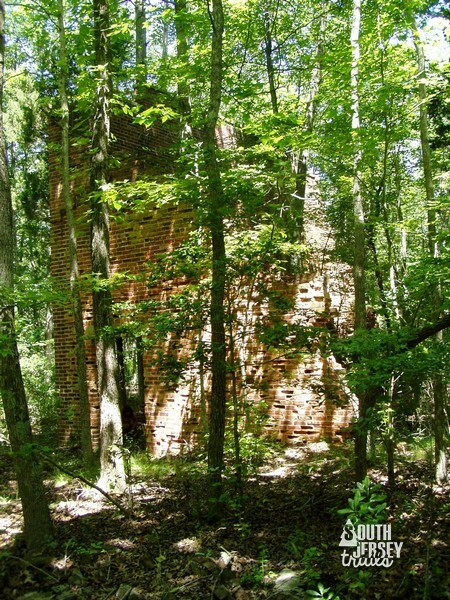 It made canonballs for George Washington’s army during the War for Independence and throughout its history produced iron slag that was later made into stoves and other products in the early days of the United States (including the fireplace backs for Washington’s home at Mt. Vernon). 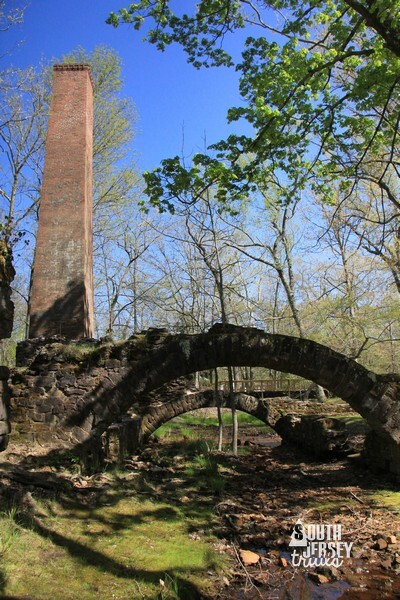 When bog iron was no longer as profitable, the Richards family (of course the Richards family) started making glass, which extended the life of this pine barrens town. 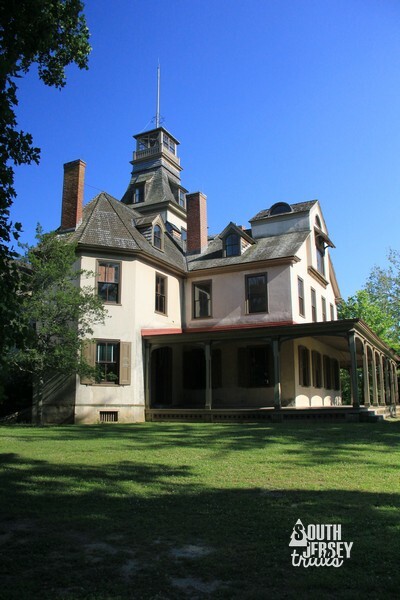 The whole complex found a new life as the home base for Joseph Wharton’s pine barrens business empire, at which time the mansion was used as a summer home by the Wharton family. 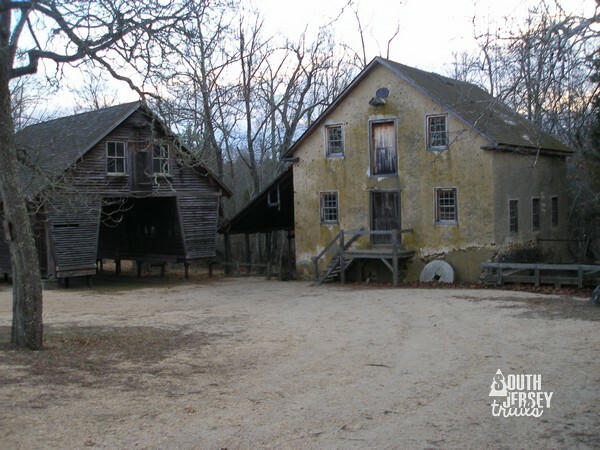 Today, Batsto is the best preserved of the old pine barrens towns, a place where you can visit the Richards/Wharton mansion, walk through the blacksmith shop, or wander through the old sawmill (which still functions) or gristmill. 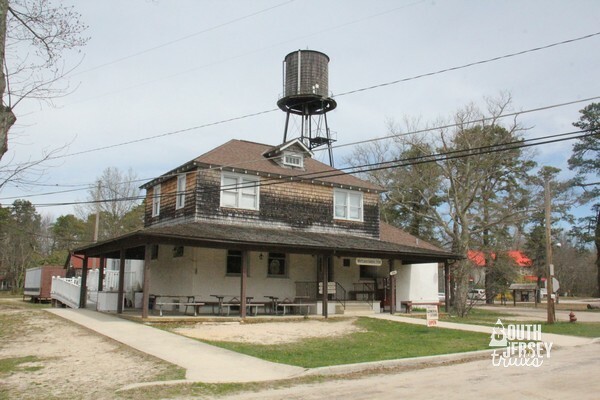 The visitors center features a beautiful museum that was redone a few years ago, which explains the history of Batsto and the pine barrens. 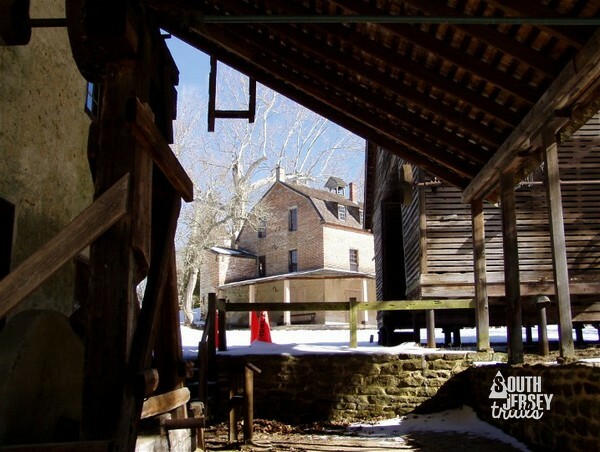 General store from the mill. 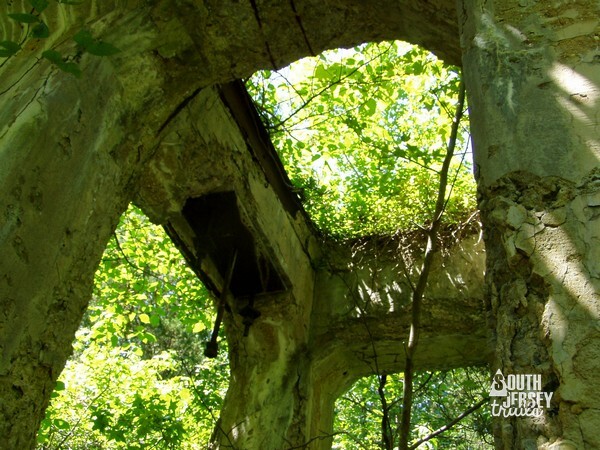 Batsto also features one of favorite events – the Batsto Country Living Fair – each October, which is well worth attending for the antique engines alone. RIP to our favorite local history bookstore – the Cheshire Cat at Buzby’s Chatsworth General Store. Unless someone wants to give me enough money to buy and run it, which would be amazing. What about BOMARC. 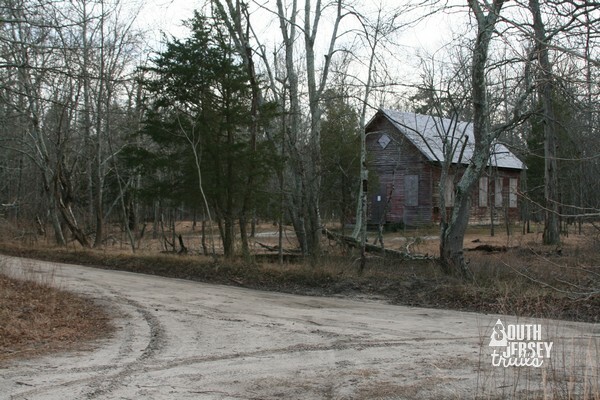 Would you consider this a ghost town? Interesting history, absolutely. Since it was a military instillation and not a town, I think it’s a little different though. I’m def gonna take my daughter to see some of these places. She like history and creepy places just like her mama. Thanks for all the info. Love everything you write! Over the years I have seen many of these places. 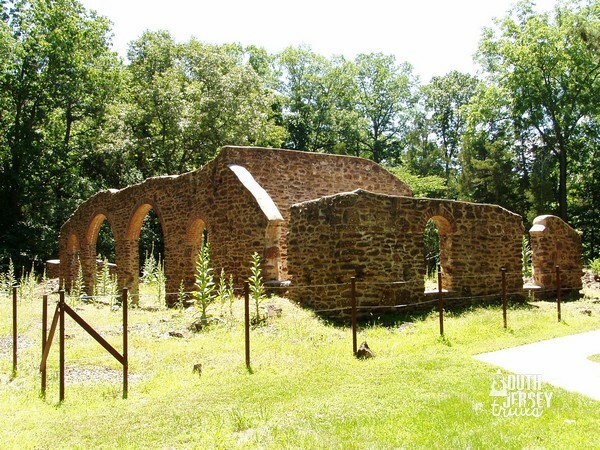 Especially loved the area behind the Pleasent Mills Church and the forgotten town of Washington.. 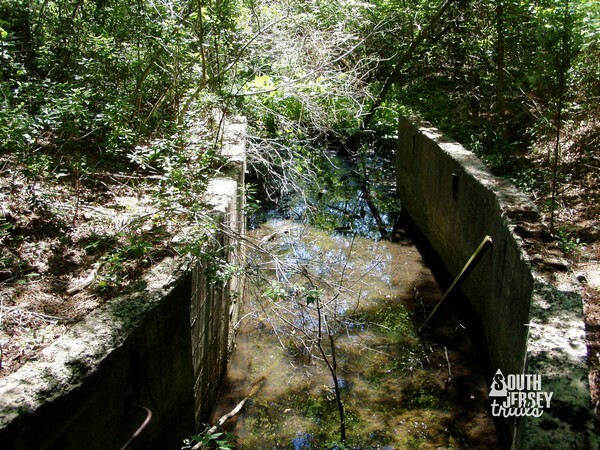 It is a quiet , haunting place with cellar holes, and the remnants of wells. Keep posting, I follow your posts all the time! I especially enjoy you hiking companions! ❤️ Once a Jersey girl, always a Jersey girl! 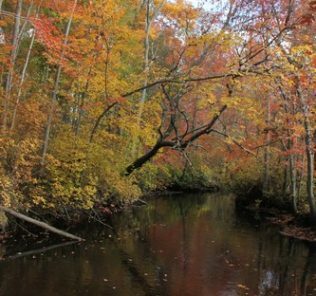 What about Forked River Mountains and its history? 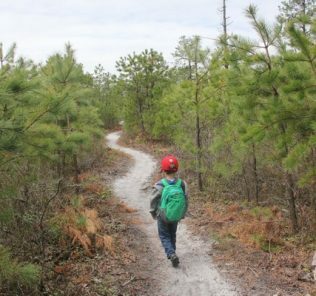 What trails in the pine barrens are haunted? 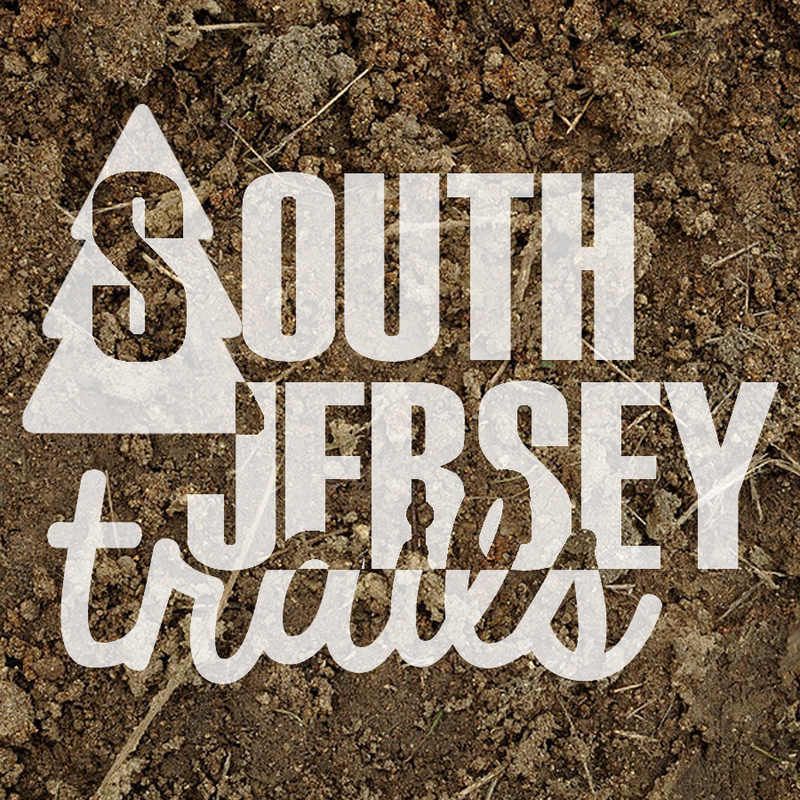 Only trail I’ve heard specifically as haunted in the Blue Hole Trail.